The Oriental Shorthair Cat is an inquisitive and confident animal that is both a 'livewire' and a treat to have around the home. This breed is blessed with an abundance of charisma and intelligence, loves to live life in the fast lane and cannot help but to captivate everyone that it comes in contact with! Being such a self-assured cat, the Oriental enjoys being involved with the entire family and will happily take part in all of the daily activities whether it be playing in the garden or sitting on your lap watching your favourite television show. 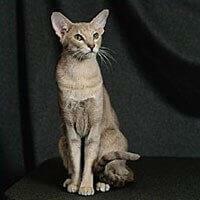 The Oriental Shorthair was developed during the 1960s by mating Siamese cats with British, European and American Shorthairs and have therefore inherited a lot of the Siamese characteristics. Its personality closely resembles that of the Siamese cat and can therefore be resourceful, demanding, friendly and extremely extroverted all at the same time. They love to 'talk', but they are not as loud as their Siamese cousins. They thrive on human company and do not like being left alone for long periods - they will run to greet their owner/s on their return home and will also want to be shown attention before you settle down to any other activity.